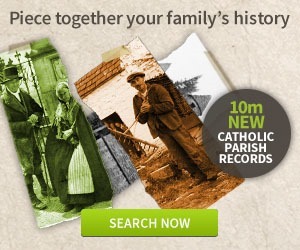 And now it's Ancestry's turn to launch an Index to the Irish Catholic parish registers collection! All 10million register entries, which include some 40million names, are now indexed and linked to the National Library of Ireland's images in Ancestry's database. By far the greater number of these entries date from between the early 1800s to 1880/2, but a small number pre-date or extend this time frame. The collection holds records from more than 1,000 parishes across the island; only a handful of parishes are not included. To celebrate the launch of the index, not to mention St Patrick's Day and the 1916 Easter Rising centenary, Ancestry's entire Irish collection is being opened up with free access for the month of March, all 31 days! You can view a list of the free-to-access Irish records sets here. If you don't already have a subscription, you'll need to register for an account with Ancestry. You have to give your name and email address, that's all. No financial information is requested. Once your free account is confirmed, you're ready to start searching and making discoveries.